Department of Agriculture Approved Disinfectant for TB. 1. On the Department of Agriculture’s list of approved disinfectants for Tuberculosis, Brucellosis, general farm disinfectant, Foot & Mouth disease and poultry diseases. 2. Stabilised iodophor disinfectant for surfaces and water systems. 3. Performs on Cattle, Sheep, Pig and Poultry farms. Recommend dilution rate of 3% w/v for Tuberculosis and general orders (e.g. Salmonella and E-coli). A dilution rate of 0.5% w/v is recommended for Foot & Mouth disease, Swine Vesicular disease and diseases of poultry. Apply mixture at 300ml per square metre. Use a dilution rate of 0.5% w/v and change when heavily soiled with organic matter or on a weekly basis. » For poultry water treatment disinfection, please refer to label for instructions. 6. Applied by spraying, foaming or for use in footbaths. 7. Available in 25lt & 5lt containers. 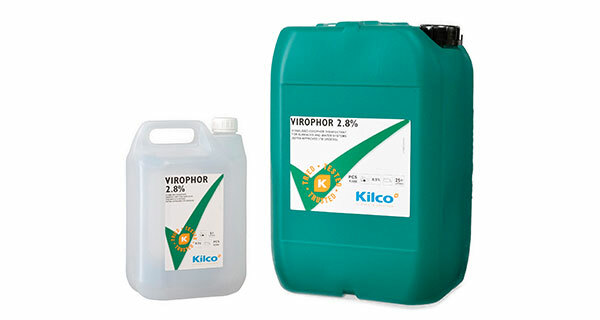 To download VIROPHOR 2.8% product information, click here.